As the setting sun casts a golden glow, a group of Lancasters from 576 Squadron form up after departing from their Lincolnshire base at the start of a raid into Germany in late 1944. The lead aircraft UL-I (LM227) was one of only a handful of Lancasters to complete 100 operational sorties. 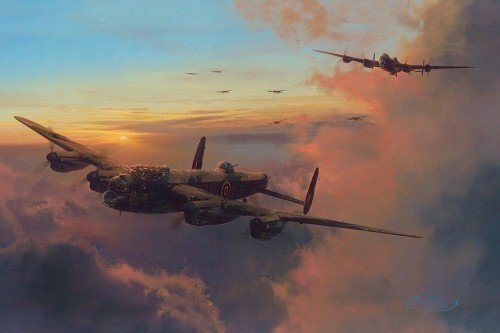 Robert Taylor’s evocative painting is a moving tribute to these men of Bomber Command.